PrepLadder congratulates Dr. Nikita Mary on securing Rank 64 in DNB-CET July 2018. We wish her all the best in her career and future ahead. To find out how she achieved this incredible feat, we spoke to her and tried to understand what it takes to attain such a rank. We would like to share the excerpts from her interview so that we can all learn from her experience and use it to score our mark. Hi, I'm Dr. Nikita Mary Baby from MOSC MEDICAL COLLEGE, Kolenchery, Kerala. I had an All India Rank of 64 in the DNB CET JULY SESSION 2018. Always focus more on MCQ if you have a reasonably good foundation. I never attended coaching classes so I never had any standard set of notes to study. I had self made notes from the explanations of the MCQs I did. They were extremely brief one liners. I have done MCQ's from almost all subjects during my MBBS days from the college library. (I frankly don't remember the entire list). After internship I focussed on doing complete question papers over studying individual subjects as I felt it would yield quicker results. So, I have completed the following books before writing DNB. Yes, I gave AIIMS exam and my rank was in 7000's. I also wrote jipmer and my rank was in 1200's. I was able to significantly expand my knowledge base, increase my exposure to MCQ and perfect my revision technique before my DNB and that made the difference. Revise...the only thing that will make a difference between you and the rest of the world is how well you can revise. Questions repeat from the papers of apex institutes like AIIMS, JIPMER and also NEET. Never get a repeat wrong. To not get a repeat wrong...write it, read it and revise it. Getting a repeat wrong is an unpardonable mistake which invariably demands a heavy price in terms of rank. Prepladder has helped me in the following 4 ways. 1. The daily quiz section of PrepLadder is amazing. With carefully handpicked 10 questions daily from different areas(often difficult and overlooked)..it has often served as an eye opener to my areas of weaknes. 3. The national level mock tests offered by PrepLadder along with the other mock tests that are available with it's short and clear explanations was a great bonus to expand my knowledge base. 4. Prepladder's feature of publishing written interviews of toppers gave me a lot of insight on how to modify my study techniques for the exam. Yes, I used a time table. But I preferred making a time table that was based on time allotted over number of topics covered. My logic was some topics are easy and we may cover them in a short time..and those days we might feel like we have overachieved. Some topics, on the other hand are long and hard and those days we might feel unproductive. If we focus on time allotted...I feel we might do more justice to the topics...and feel productive always. I was never a topper although I was a hard working student with an aggregate of 69.5 percent in MBBS. Not revising is the biggest mistake one can make. Not attempting mock tests is also an equally grave mistake. I would urge all aspirants to give mock tests regularly irrespective of your knowledge levels as ranks will improve only with practise. I was very calm when I wrote the exam. I attempted 295 questions. Since I had attended many mock tests and was doing MCQ'S on a regular basis, I had adequate time and energy during the exam. 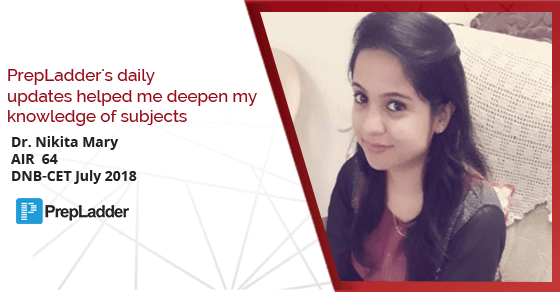 We thank Dr. Nikita Mary for sharing her success story.